It is without a doubt that if you were an investor in March of 2009, you should have bought stocks when uncertainty around the economic future thanks to the Financial Crisis was at its peak. Today marks the 8yr anniversary of the "bottom". The S&P 500 traded at 676 on March 9th, 2009 and has since risen to 2,370 today. The economy is in much better shape today than it was 8 years ago thanks to low interest rates, economic stimulus, quantitative easing (QE) programs, etc. The prospects for the future are near a peak not seen in a decade with optimism around tax cuts, infrastructure spending, the release of untapped potential via regulation changes, etc. Price to earnings (PE) ratios on the S&P 500 have increased steadily since 2009 from the low 11's to almost 22 today. That means investors are willing to spend twice as much today as they did in 2009 for the same earnings stream. The difference is the environment, in 2009 earnings were expected to go down versus today they are expected to keep rising. Are stocks overpriced? Investors must choose between a whole variety of investments and generally cash is not a good option. Whether it be stocks, government bonds, corporate bonds, commodities, etc. really depends on one's appetite for risk and desired return, plus potential statutory obligations. For simplicity sake let's assume an investor today must decide between stocks and bonds. Would you rather own a potentially overpriced stock but potential upside with legislative changes or a bond with a low yield and potential inflation on the horizon? If one purchases a 10yr treasury at a yield of 2.55% and inflation is 2%, then the real yield is only 0.55%. Bonds seem much more unattractive if you believe the growth story that buzzes around the market. The stock market and bond market are not in agreement. Stocks are trading at all-time highs and the 10yr is still trading under this resistance level of 2.60%. Not to mention both the non-farm payroll report and FOMC meeting are right around the corner. Is someone in for a surprise or will this divergence of opinion continue? The market has completely priced in a 25bps increase to the Fed Funds Rate next week. With a strong payroll report there are a lot of whispers of four potential increases this year instead of the three predicted by the Fed. Remember the Fed must meet its dual statutory mandate of full employment (5% or less) and stable inflation (around 2%). 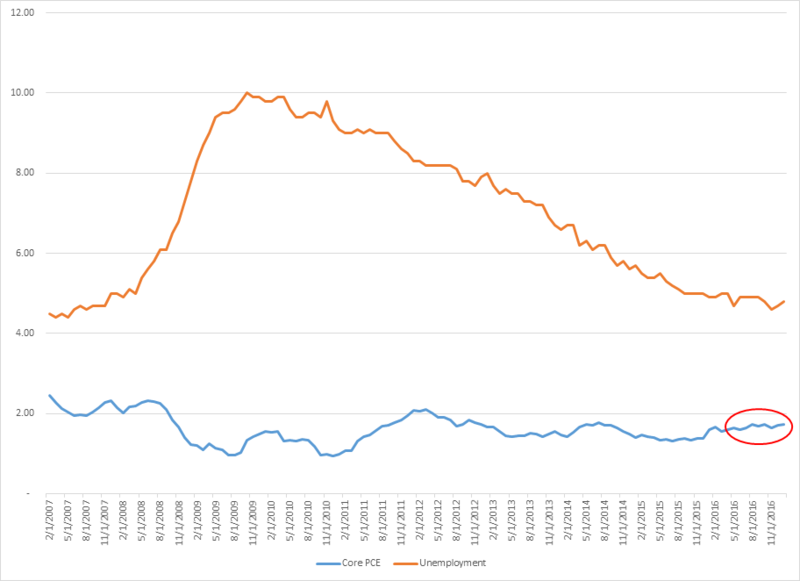 It's safe to say that they have met the employment mandate with the unemployment rate around 4.7-4.8%. Inflation has long been the challenge and core PCE (the Fed's preferred measurement) was released last week showing a year over year change of 1.7%. The Fed will raise when it feels that inflation will move to 2% or higher. To illustrate the dual mandates, see graph below. I 've circled the current inflation measurement and it's not exactly screaming "raise rates!". That's where the Fed must turn to leading indicators of inflation and that makes the rate decision tricky. On the inflationary side, consumer spending is up, as are wages with the possibility of tax cuts and infrastructure spending on the horizon. It's even argued that the expectation of inflation ultimately causes inflation. On the deflationary side, oil and gold are down, higher interest rates strengthen the dollar and that hurts exports, not to mention considering how low unemployment has been, wage inflation should have already accelerated. Not to forget a potential global trade war coming and an administration that has openly stated the dollar is overvalued. Short term rates might move higher with the Fed but long term rates might remain at these levels. If the yield curve flattens (short term rates and long term rates are at the same level) then the market is telling the world that recessionary risks are material. That is still down the road but something to keep an eye on.